The purpose of the DH funding is to pay for dialogue re-recording for my re-scoring of the 1941 Chinese animated film Princess Iron Fan which is the centrepiece of my PhD in Composition for film. The research context relates to exploring the relationships between ancient Chinese and contemporary mainstream Western musical cultures, techniques and aesthetics, creating a hybrid musical language which responds both to the demands of the film structure but also reflects the hybrid nature and visual and narrative content of the film itself. As this is a practical project, in this report I will focus on practical things in a reflective way– where recording dialogue fits in with the whole scoring process, and how I approached the actual recording process. The composition process followed the methodology outlined in Karlin and Wright (1987) and others of creating a motivic film score, a practise that was common for animated films of the period. This includes (standard) procedures of creating a cue sheet, spotting synch points, planning metronome marks and composing leitmotifs for each character. I wished to weave the score from my own original material combined with musical material and practise from the Tang Dynasty (618-907) including actual quotations from music from that period. The nature of my initial research was archival – I immersed myself in musical practise from the period, using ethnomusicological monographs in Taiwan (which have not been translated into English and are not available in the West). The composition of themes and the cue sheets, synch points and spotting followed this. The process of re-scoring a film with an existing soundtrack also required me to remove all the original music, the original dialogue and the original sound effects, and then to replace them all: as these originals were not available to me as separate tracks, my only option was to re-record them. The purpose of this award was for me to do this with the dialogue. In order to re-record the dialogue it became clear that I would need to recreate the film script, which was not available in published form. 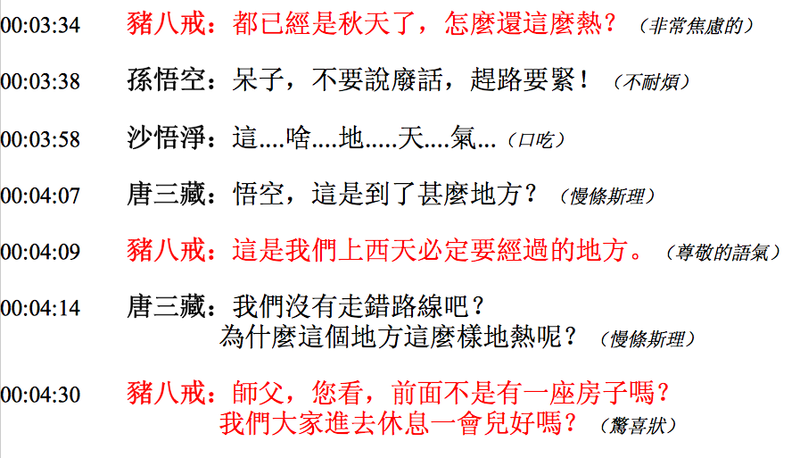 I transcribed all the dialogue of the film in mandarin, listening painstakingly to each spoken sentence and writing it down in a standard script format that also including timings. This was a new (and slightly daunting) experience for me, and I learned as I went along, the role of a script editor. It’s already autumn, how can it still be so warm? Fool, don’t take rubbish. We should hurry and get on our way. Wukong, where is this place? We must pass through here to continue westwards. XUAN ZANG: Might we have taken the wrong path? Why it is so hot here? Master, look! Isn’t that a house up ahead? Let’s go in and rest for a while, OK? My next task was to audition and rehearse Chinese voice actors and actresses for the central characters of the film. Given time and money constraints I used six very obliging friends of mine, and in some cases cast them in multiple parts. The characters they were playing include the Monkey, the Pig, Princess Iron-Fan, the Sandy, the old monk, the Bull King, the Buddha Xuan Zang, and Princess Jade. I should say that there are not many professional Chinese and Taiwanese actors/actresses in Southampton area, even if I’d had the budget to afford them. Two of my criteria in casting were to select actors (i) in the Southampton area for practical reasons that (ii) had Beijing accents. 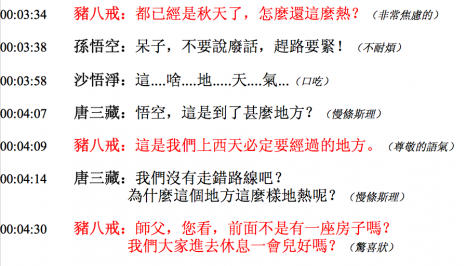 A Beijing accent is very similar to a standard mandarin accent, except for the proliferation of rhotic vowels (érhuà (儿化) in mandarin). The Beijing accent is associated with traditional Chinese cultural expression (for example Beijing opera), and I wished to deliberately use it for symbolic reasons, which would be understood by Chinese audiences. My goal here was simply to achieve spoken clarity, understandable to as many mandarin speakers as possible. The Beijing dialect and Standard Chinese in phonology are almost identical. An analogous equivalent in the UK would be selecting newscasters based on their accents, or using Received Pronunciation in casting theatrical roles in England, for example. The Beijing dialect tends to emphasise the initial consonants, and soften and shorten the vowels sounds. There also tends to be greater variety in expression of final consonants and tones, compared with, say the patois of mandarin spoken in southern China, For the female roles, I chose Taiwanese actresses partly due to who was available, and partly because standard Chinese is spoken in Taiwan. On the whole the Taiwanese accent is softer than the Beijing accent, and as it seemed, in a way, to map onto the otherness of the characters of Princess Iron Fan and Princess Jade – magical, powerful ‘other’ women. These are creative decisions on my part – and it may be that if they invoke discussions on cultural politics, they were also the best solutions available to me given the time, budget and casting constraints. At the initial read through, I learned another two roles I had not anticipated at the start – I was acting as a director and voice coach simultaneously – and these again these were new jobs to me, and proved something of a learning curve. I also played two of the roles myself, and so also became a voice actor. Henceforth I will use ‘we’ to indicate choices and discovers made by the actors as a collective, and ‘I’ to mean me as project supervisor, and I will switch between them. Firstly, we watched the film, which helped us to understand the story and personality of each of the characters. Secondly, we decided on the voice of characters for each actors/actresses according to their personalities. I had not yet cast assigned the roles to specific actors – rather, I wished to enable the actors to see if they resonated with a character or a role or felt could bring something to it. So we experimented with different actors trying out for different roles in a collaborative way. Although the final decision was mine, the actors were also fully involved with finding their characters, and their feedback was that this two days process was empowering and fun. I decided to record the actors together at the same time so they could work off each other, and I could capture the nuances of the live interaction, rather than doing all the lines individually. I did this partly because these are friends playing the roles and I wished to give them all the help I could. The recording was done initially both in my flat using my modest home studio, and in the (more sophisticated) studio in the music department. Usually I asked the actor to give five renditions of each line, each one with a slightly different nuance, including delivery, emphasis, and attitude. One a portion of the script has been recorded I included the group in deciding that were the best takes, wishing to listen to their feedback. On the whole we tended to agree where one take stood out from the others. The recording was done using the Logic Studio programme, a standard professional piece of software that is in common currency with mac users in the film industry. The programme allows great sophistication in terms of aligning the spoken take to the lip movement of the animated characters and the appearance of the subtitles. This is a tricky and time-consuming process – and obliges us to mimic the speed of delivery of the original voice track to a fastidious level. However it is gradually becoming easier as we developed our own practical methodology. One of the particular challenges has been a sequence in the film where Princess Iron Fan sings a song (which starts around the 46th minute of the film’s running time) which uses subtitles and a very early incarnation of the ‘sing-a-long’ bouncing ball to indicate the words to the viewer. This requires me to write a song that has the same rhythm as the sing-a-long bouncing ball (which became a practical issue of detailed spotting). At the time of writing I have yet to complete it, but I have decided to use theme of Princess Iron Fan as the thematic material, and intend to place the singing style somewhere between operetta and musical, again consistent with the musical style of animated films of the time (for example Wishing Well in Snow White). At the time of writing, I have successfully completed all the preparation the transcription and rehearsal. I have also recorded 18 minutes of the total 73 minute of the running time and am on schedule to complete all the recording by the end of July 2013. The project is running in real time and has to accommodate the practical realities of working with a large and diverse group – for example a number of the Chinese actors are returning to China for periods of time, for example. After the dialogue recording is completed the final stages of the project involve dialogue track mixing (making sure the voice levels (volume, reverb etc) are consistent through the entire running time, and then to assimilate with the sound effects track and the music track which will take place later on in the year. The result of the project it is hoped will be a public presentation of the re-scored film with dialogue and sound effects in the end of 2014 a prominent venue which is still in negotiation (I am looking at Turner Sims Concert Hall or an art-house cinema like Harbour Lights). Because of the copyright on the film, I will present this film giving all profits to charity. My understanding of English law is that copyright is not a problem as this is unequivocally for educational purposes. I am hoping the public presentation of the film with my new score will be a tribute to the astonishing efforts of the original director and animators, who created a highly original, important and (in the West) little known work of art. Princess Iron Fan as well as being a funny and entertaining animated film, is, I believe, an eloquent symbol of the eliding cultural negotiation between East and West, and as such feeds into very current political, social and cultural questions of changing identities, adaptations and hybrid forms. If a success, I also hope it will also be good PR for the University of Southampton and the music department.